People are looking for leaders. They are looking for someone who can help solve their problems, someone who can inspire them. They are looking for thought leaders, individuals or companies who change the world around them. Thought Leader video is a form of marketing where you position your brand as an authority in your industry. The big idea is people want to do business with experts. By demonstrating your expertise through thought leadership video, it shows that you are the person or company they want to do business with. People don’t like to constantly feel like they are being sold something. They want solutions to their problems. Thought leadership video allows people to interact with your brand in a way they want to, without feeling like they are being sold something. If you are in business, then you are an expert, but you need to prove it. This works best for B2B and B2C companies whose clients and customers have a high lifetime value. Thought leader videos are a great introduction to your company. They build trust when someone has a problem. You can think of the marketing process like a funnel. People find you at the top of the funnel and you guide them down the funnel until they come out the bottom as a customer. Thought leadership video gets people into your funnel so they come out the bottom as customers. Thought leadership video builds rapid relationships, showing your company as someone that customers want to do business with. The internet is over saturated with content. It used to be you could just create a video and it would be on the front page of YouTube and Google within 24 hours. However, content is no longer king. The viewer is king. The old king is dead. You better get to know the new king because kings are hard to please. This means you need to not just create content but create content that is valuable, and that people are looking for. How do I find my video topics? Think about this: What would someone search for online to find the problem you solve if they didn’t know you existed? You probably already have a list of things that would make good topics. The important thing to remember is that it’s not about your company. People are looking for ideas and a solution to their problems. You need to find out what people are looking for online around your product or service. Be careful not to talk to others in your industry. For example, if you were in construction, you wouldn’t create a video about hammers. Someone looking to build a home doesn’t care about hammers. They want to know stuff like: How long does it take to build a home? and Are the products being used to construct my home safe for my family? Creating a video about hammers is just going to attract your competition. Another idea is to use your frequently asked questions to help you create your videos. Talk to your sales team and have them write down every question they get as a part of the sales process. Look out for tentpole events and create content for them. Tentpole content happens around holidays or special events. If your industry has a big trade show, make sure you have content that takes advantage of the buzz around that event. Maybe your tent pole event is the Super Bowl or a new product launch. Whatever it is, make sure that you take full advantage of it and create content for it. Take those questions to Google and figure out which of those questions are being searched for the most. Look for the keywords that you should use as part of those videos. Make sure you choose topics people are actually looking for. A lot of people seem to get hung up on this. Based on what people are looking for, you may have to create a video about a topic that really doesn’t solve the problem the viewer has so that you can introduce them to the real solution. It is very common that they are not searching for the right thing. For example, in my business, we use the keyword ‘videographer’ but in actuality, we are an agency, not just a videographer. A videographer is someone who runs a camera. A video agency solves problems and gets results. Videographers are not marketers and they are not creative directors. They don’t know how to get the results for our clients. Do we have videographers on our team? Yes, but they fill a role and are part of the solution. They alone don’t solve the problems people have. Next, make those topics or questions into best practices or take them one step further and make them next practices. Who is the expert in your company? Someone at your company should be in the videos. This should be someone who has some energy and excitement. It should be someone who is coachable, someone who is willing to learn how to do this. I have directed a lot of people on camera over the years. I would much rather work with someone who is coachable as opposed to someone who needs to protect their ego. If you already do public speaking, chances are that it won’t take much to have you looking great on camera. Just like everything else, the more you are on camera, the better you will become. Working with a professional director will help you get better faster. Don’t try to hide behind animated or motion graphic video. These styles are great for explaining complex ideas, but it doesn’t do a very good job a building relationship. There are two ways to create the scripts for these videos. One way is to hire a scriptwriter. Many companies I talk to want to handle the script writing process internally. I understand why. They are the subject matter experts. However, I see one of two things happening with scripts that are written internally: 1. They never get done because it is a lot of work or 2. They are not written properly. Script writing is different than other types of writing and the format the scripts are written in is very important. The second way is to not create a script but ask questions. Once you have the topic, create some bullet points that should be covered in each video. This will ensure nothing is left out. That way, you can ask the person on camera a question to get them talking about the topic and check things off as the points are covered to make sure you don’t forget anything. This question format scares some people but often you get better results from these non-scripted videos. We have found that many experts can talk all day about the subject matter that is part of their job. For example, ask a plumber to read a script and it may not go so well. However, if you ask him to tell you about how to change a toilet fill valve, he can talk your ear off. A ‘questions and answers’ format makes your videos feel more authentic. This also makes the videos look and sound more like a conversation. Again, this all depends on the person who is speaking on camera and what works best for you. Non-scripted is more cost-effective than scripted because it takes a few weeks to write all of those scripts, but you can bullet point a year’s worth of content in a day or so. It really just depends on your expert and what works best for them. It is important to release your videos on a schedule, just like your favorite TV show. The best way to do this is to create a video once a week. I know this sounds like a lot. I have struggled myself to hit this goal. If you can’t do once a week, do once a month. The idea is to let your audience know when they can expect a new video. Whatever your frequency, make sure that you tell your audience when to come back for a new video. The secret to succeeding at a frequency is to have help. Whether you are a solo entrepreneur or a Fortune 500 brand, you can’t do this alone. If YouTube is part of your strategy, and it should be, you should start your YouTube channel with 8 pieces of content before you even launch your series. We find the best way to save money on thought leader video and to use your people’s time wisely is to record all your videos in one day. This takes some planning, but it is worth it to record 12 – 52 videos in one day. Depending on the style and subject of the video, sometimes we will record 6 months of content for a client in 1–3 days. To accomplish this 52 in one-day goal, it is important to either have someone who has experience as a speaker or have more than one speaker. One person can do between 15 and 26 videos in one day if the videos are around 2 minutes long each. Some might be able to hit 52, but the best way to do this is to have multiple speakers. If you are using scripts on a teleprompter, it is important to have everyone who is new to video rehearse their scripts in front of someone else at least once a few days before recording. Even if you are using a teleprompter, this rehearsal will help you know who needs to spend a little more time preparing for the recording session. I have seen more than one client waste money on a video crew because someone at the company thought they could just walk in and give an Oscar-winning performance their first time on camera, but in the end that person crashed and burned at their performance. If you are planning to use the question and answer format, rather than a script, a rehearsal isn’t as important. However, a quick run through the questions wouldn’t hurt. You can do this with a cell phone or a webcam. Just make sure you don’t use the built-in microphone. I recommend this wired microphone for smartphones from Audio Technica. You can also use a DSLR camera or, my personal favorite, a cinema camera. Thought leadership video is best done as part of a campaign. They need to have a life outside of your website and sales team. Now that you have invested time and money into these videos, you need to distribute them. I recommend sharing at least one per week. I talk to a lot of companies who just want to get the videos out there. This is a mistake. You need to maximize this opportunity. One example is to use custom landing pages when posting them to your website to drive email signups. Upload one video a week to social media sites such as Facebook and YouTube. Make sure you find the channels that work best for your business based on where your target audience is so that your video will get the maximum engagement. You can organically let the search engines find your video but, if you want to supercharge you campaign, you need to purchase paid ads. Uploading one video per week and then sharing it with followers is a slow way to grow as a thought leader but advertising on sites like YouTube, Facebook or Linkedin, depending on your business, is how you get rapid growth. I talk to a lot of B2B companies that think Linkedin is the best place for their videos. For some, it might be but if you are a C-level executive, ask yourself when was the last time you were on Linkedin? That’s right. You were probably looking for a job. So, do some research to make sure it is the right place for your video. We see B2B companies and B2C companies getting great results from Facebook. I know that might be hard to believe but 70% of the world is on Facebook and ad rates for video are very affordable. Creating a thought leader video series isn’t easy. Those that dare will be greatly rewarded. If done right, it will be difficult for your competition to replicate. 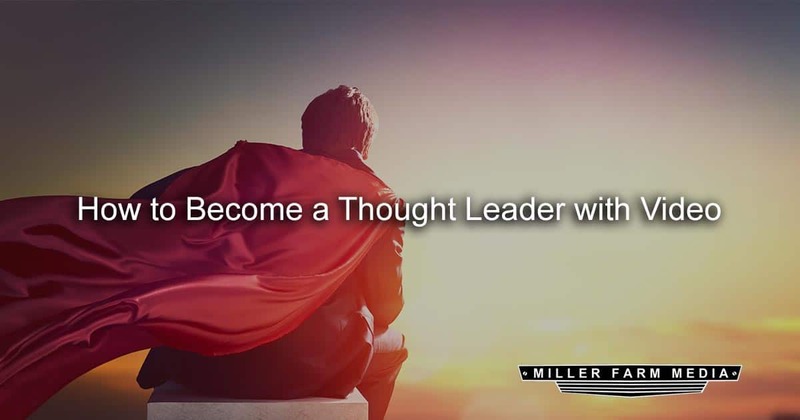 If you are in a space that is already crowded with thought leaders, you still have an opportunity by looking for a unique way to stand out from the crowd of other thought leaders in your industry. Coaching – We offer this service by the hour. You can ask our expert anything. Virtual recording – we direct you via Skype and help you record your videos using your cell phone, webcam or whatever camera you have. Course – coming soon! Sign up to be notified when it is ready! Done for you. We handle everything so you can focus on your business – we do everything, coaching, help you choose the topics, creating the campaign, recording, editing, and social media campaign.